With Direct Ferries you can find a Ferry to Catania and quickly and easily compare with other sailings to Sicily or neighbouring countries to ensure you book the best crossing available. Not only will you get a ferry price for your chosen sailing but we’ll also show you prices for ferries to Catania around your preferred departure time as well as sailings to alternative destinations to ensure you get the best available price for your trip. "A very pleasant passage. " We had a very pleasant crossing from Naples to Catania. The staff were all courteous and helpful and our cabin was clean and comfortable. I recently read bad reviews about the ferries in Italy. 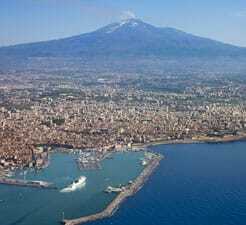 This trip from Napoli to Catania Sicily was perfect. The cabins were larger than I'd expected, the self service restaurant food looked great. Everything was easy, getting on and off (however the boat was not that full). We did the return journey. Very clean ferry and early in both directions. Nice cabins with good showers and a/c. Good food for a ferry too.